On January 12th, we would have celebrated your 82nd birthday together. Instead, those of us who knew you best wore pink and red in tribute to your love of those colors together. Of course some of us still question that combination. I remember you always loved our family celebrations. Celebrating those you loved so dearly was one of your greatest passions. I know you would enjoy being here with us. Seeing, holding, and playing with your great-grandchildren would be one of your many pleasures. I can see you talking with them as you cuddle the little boys and discuss a great many things with the older little girls. You were a wonderful grandma and I know this from having you for a wonderful Mom and through word of mouth and deed from my nieces and nephew. You would have been a super-wonderful great-grandma. I know you would still keep in touch with your family and friends through your letters, still hand-written, and via email and now, Facebook. You would have really liked connecting with people through Facebook — so many messages, photos and links to more information. I still have some of the letters you had written to me. We celebrated Stuart’s birthday on January 8th. We all gathered at Laurie’s. Had a nice dinner, something he would have liked and cupcakes, complete with birthday candles. We lit the candles, sang Happy Birthday to him, then your great-granddaughters blew out the candles. I know this is something you would have done….. so, we did it. This made Stuart’s birthday not as difficult to get through. Yesterday, we again gathered at Laurie’s. This time to celebrate Natalie’s birthday. Of course we had her favorite food, BLTs. And, as was your way, we celebrated with ice cream and cake. Another party you would have truly enjoyed. Family celebrating family. On your birthday, besides wearing red and pink (eesh), I went to a favorite Mexican restaurant of yours and had enchiladas and a flan, in your honor, for dessert. Oh my, was I full. That evening, I made a custard pie and learned that Jeff really likes custard pie. Yet, no one I know, or will ever know, will like custard pie as much as you did. Mine was not the best, it was not yours, but, it was custard pie all the same. I wished you welcome to Club 82 on my Facebook page and I know you would have been a great member of the club. I hope to be one, some day. My great-niece does. Her 5th birthday was last Easter. We had a family party to celebrate. A double celebration. She shares her birthday with her Daddy. Best birthday gift ever. When she turned 5, she got a new dress, new roller blades and all the protective gear. Was great fun to watch her try out her new gear…after she changed out of her beautiful dress. She was a good sport as she skated and fell. Fell again, as the skates rolled out from under her as she tried to get up. She kept focused and managed to master the skate thing to her 5-year old ability. She now has a new bike, just her size and WITHOUT those training wheels. She asked her Daddy to take them off. —- Tenacity runs in our family. Her Grandpa, my brother is battling stage 4 thyroid cancer, our Mom battled leukemia. — This 5-year-old will conquer those roller blades as she’s already conquered her bike. May conquering FUN obstacles be the some of the hardest things she has to tackle. She also got a brightly colored quilt, especially made for her. To celebrate her 5th birthday. 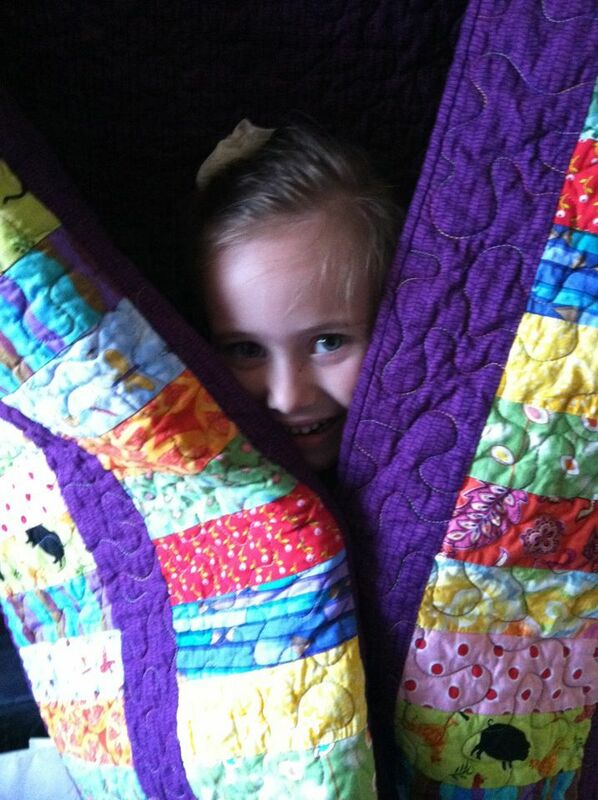 Yes, that’s her and the quilt I made with her brilliant, young personality in mind. OH, to be 5 again. She’s started kindergarten. She’s made new friends. She’s even had a few ‘boyfriends’ much to her parents’ concern. She got to experience her first Christmas break. “I am on vacation for 14 days,” she said as I faced going back to work. I was happy that her birthday was on a Monday this year. She could have her first school birthday. Well, not yet. Her school is on Spring Break now. But, how cool to be on Spring Break on your birthday. I have a few decades between me and me being 5. I do have some memories of being 5 though. Right now, I mostly remember looking forward to being 6. Do you remember being 5? My great-niece does…. but, Today, she is 6. Mom, my post about eleven and the calendar made me think of things over the past eleven years since you passed away. I wrote down the years and noted some personal and family events that have happened since January 26, 2003. Dad and I kept each other moving forward, one step at a time. Days blurred together, but when you’re going through Hell, you keep going. One of my best friends, Gary, passed away in June. At his graveside service tears were streaming down my cheeks, a gentle breeze came to oh so softly dry them. Thanks Mom. I knew that was you. In honor of your 70th birthday, I donated blood for the first time. Thanks to your great example, I had the courage to go through the process and do my part to try to give back. Dad bought a candy apple red Toyota double-cab pick up. You would have enjoyed it too. Your granddaughter, Kylie, graduated from high school. Your granddaughter, Ashley, and Nathan were married in July. A beautiful ceremony. For the Light the Night Walk annual event, in Portland, to raise awareness and money to fight blood cancers, I single-handedly raised close to $1,500. This year must have been a blur or simply uneventful, as I can’t remember much of anything really important. Your granddaughter, Natalie, graduated from high school. Your granddaughter, Ashley, graduated from Eastern Washington University. Your grandson, Grant, graduated from high school. Dad got a great report from his doctor. Cancer free for five years. What a relief. You would be pleased. Your great granddaughter, Cadence Anne, was born at Fort Lewis. Jeff and I along with Kylie and Natalie saw the musical Wicked in Portland at the Keller Auditorium. The same place we saw Cats, twice. Ashley’s husband, Nathan, was deployed to Afghanistan. Ashley did a great job holding things together, especially considering her daughter Cadence had such a hard time with her Daddy being gone. The Winter Olympic Games in Vancouver, B.C. Canada. I remember how you loved to watch the Olympics and how you were so supportive of my opportunity to move to Vancouver for work and encouraged me to make that step. Jeff and I became engaged during the time of the Winter Olympics. Ashley and Nathan had their second daughter, Piper Joy. Another great granddaughter for you. Dad battled chronic kidney disease. On the brink of needing dialysis, he did what the doctors said and turned the disease around. He still is mindful of it, but doing much better. On 9.10.11, Jeff and I were married in Athena, Oregon and in spirit Mom, you were right there with us. We had an awesome day. Jeff and I spent our honeymoon in British Columbia – Vancouver, Squamish, Whistler, Nanaimo. Natalie and Scott got married in May. Kylie and Eric got married in September – a week after Jeff’s and my first anniversary. With Kylie marrying Eric you gained another granddaughter. You’d love Mila. And Scott and Eric. Your granddaughter, Candice graduated from high school. Stuart was diagnosed with papillary thyroid cancer. Surgery and treatments followed. I was able to purchase a new sewing machine for my quilting and sewing projects. Mom, you would love it and like see what it can do. Stuart was sent to the Mayo Clinic for more testing/evaluation. Surgery was set up at a hospital in Seattle. Then things changed. The cancer had become more aggressive and surgery was not the best course of treatment, no longer an option. Another great granddaughter was born, Harper Lee. Stuart endured 8 weeks of radiation treatments five days a week and chemotherapy one day of that week. The treatments took their toll, yet, following your example, he battled back. Cadence started kindergarten. I can see you encouraging her in school. I know you would dearly love the little girls. Good so far – the best news is that Stuart is feeling stronger, recovering from the radiation treatments. Dad’s health is much better. Encouraging reports from each doctor visit. Eleven seems to be the most common. Calendars repeat themselves, to the day, every eleven years. Sure leap years will vary this, they repeat to the day every 28 years. Stands to reason, but 2003 was not a leap year. 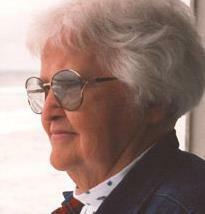 2003 to 2014 marks eleven years ago, to the day – January 26, that our Mom passed away. After all the time she had so courageously fought back the cancer that was ravaging her body, her passing was peaceful…very sad for us, but peaceful all the same. With the 2014 calendar matching up with the calendar of 2003 memories come day by day….reliving that time frame, the last month of Mom’s time on this earth. Taking a look back a few days prior to that last month, I remember that she had to be in the hospital over Christmas – yet we did have our family Christmas when she was back home – the calendar really meant nothing to us for that holiday. I do remember Dad and I watching a movie on that particular Christmas Eve, one that I will never watch again. There are so many ‘lasts’ to that January – this year when those days come around the memories seem to be more vivid, even though they were eleven years ago. Yet, because they were eleven years ago, the calendar shows them on the same day, they repeat themselves just like the numbers that represent eleven, a 1 and another 1. Some of those poignant memories, the lasts included, can be sharp and cut through your life like a piece of broken glass. Other memories of that time, the ones less painful, come and wash away some of the sadness of that day. 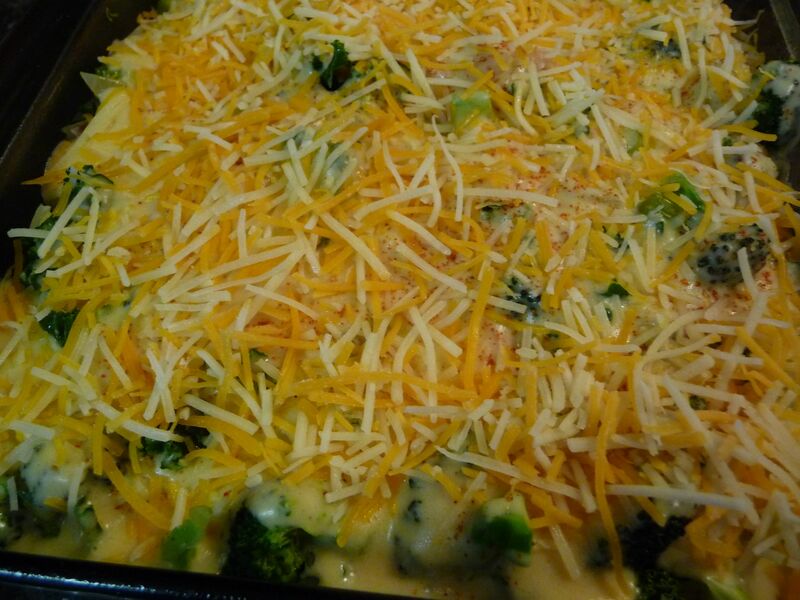 The other day while shopping for groceries, I had the idea to bake some vegetables with some cheese, similar to a casserole yet sans noodles. I knew what characters I’d cast, just not the exact script for this dish. 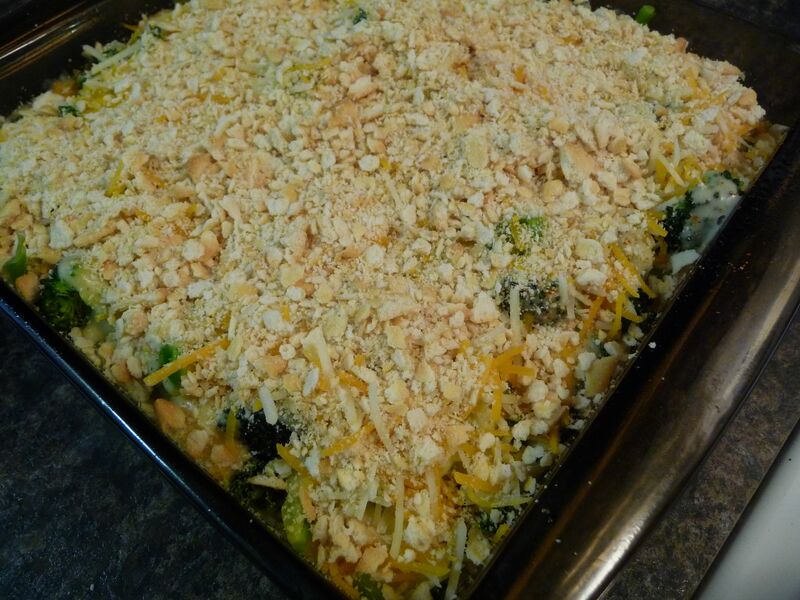 I googled broccoli casserole. 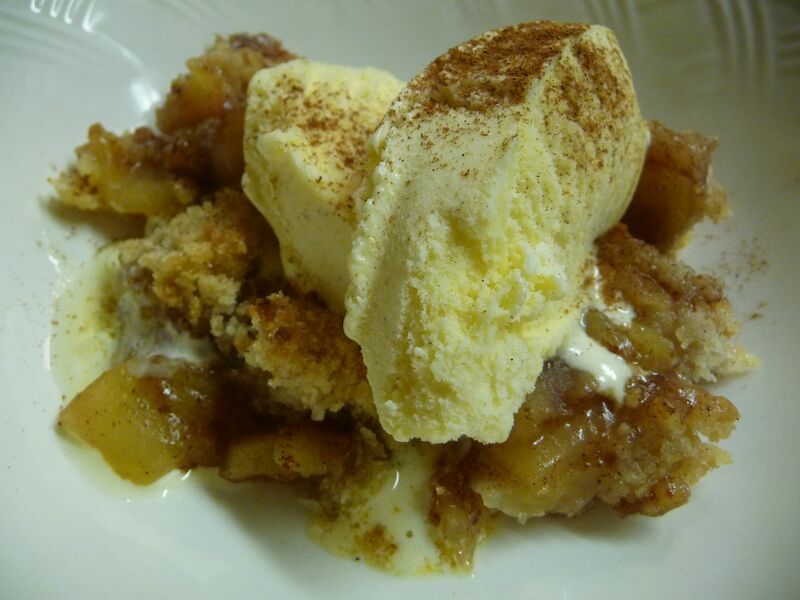 Among several recipes, I found one that matched my idea of what I had in mind to do – put me on the right path. 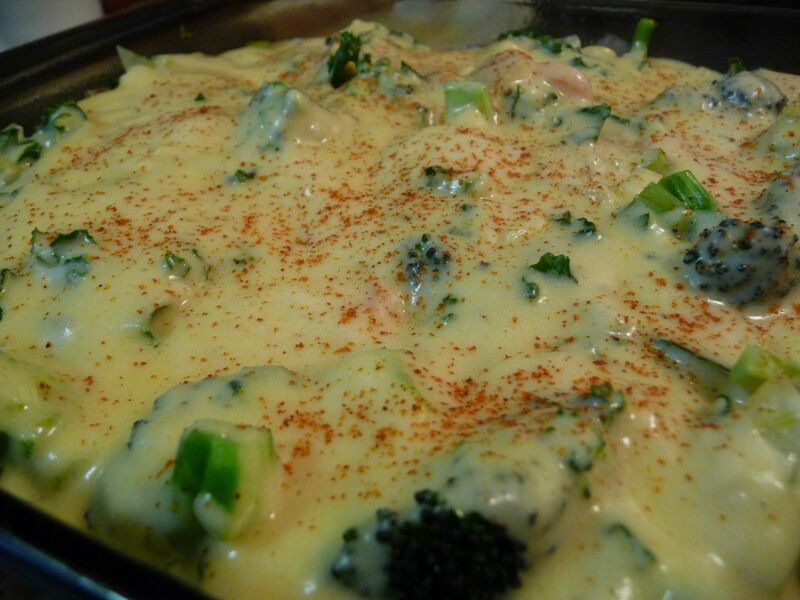 Broccoli Cheese Casserole from ‘add a pinch.com’, I simply used this recipe as a guide. I made it for our lunch today. 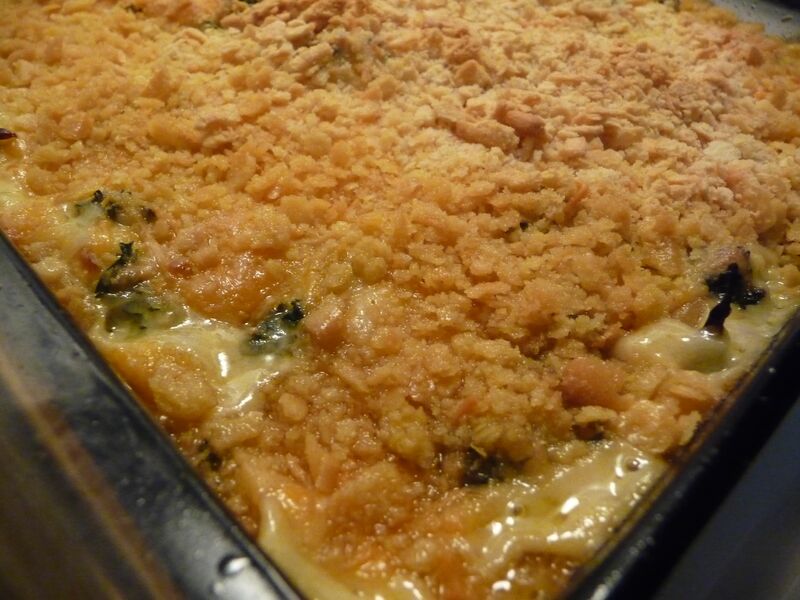 Warm, cheesy goodness and healthy too. 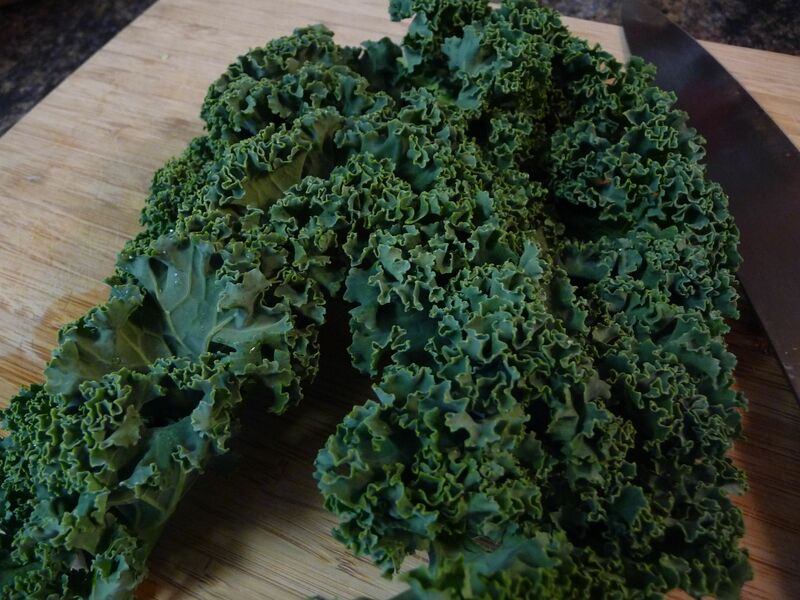 In addition to the broccoli, I chopped and sauteed onion, celery, carrots and near the end added some chopped kale. 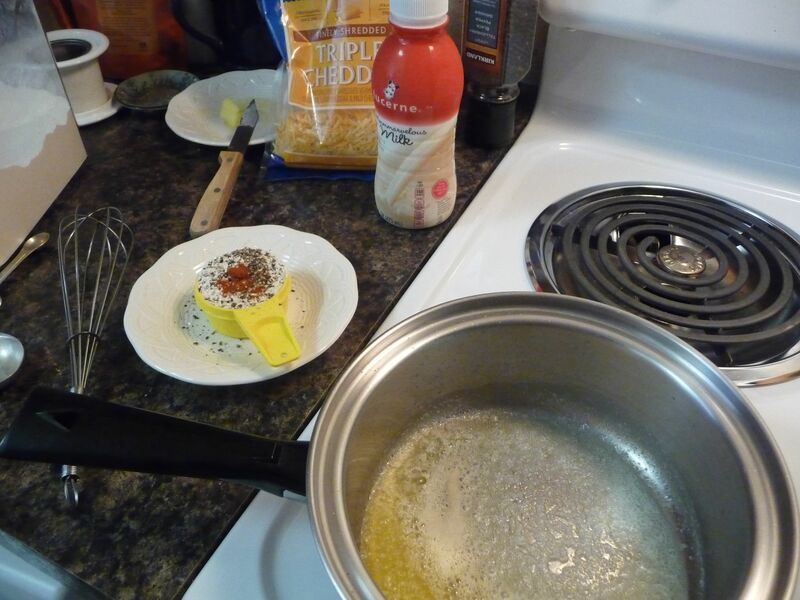 I seasoned the veggies to our taste – a small amount of red chili flakes, salt and pepper. I let the saute rest on low heat while I made the cheese sauce according to the recipe (yummy). 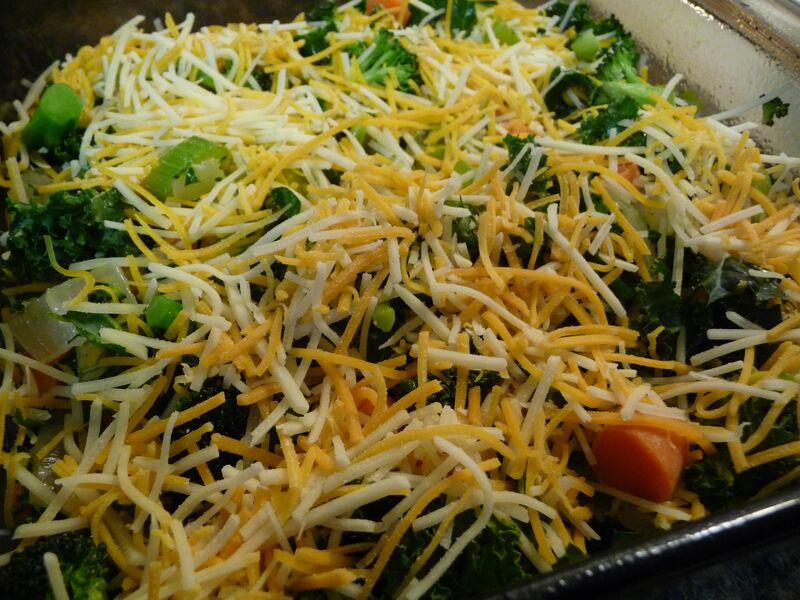 Then I spooned a layer of veggies in my pan, then a a layer of shredded cheese and the rest of the veggies. Now, for the cheese sauce. 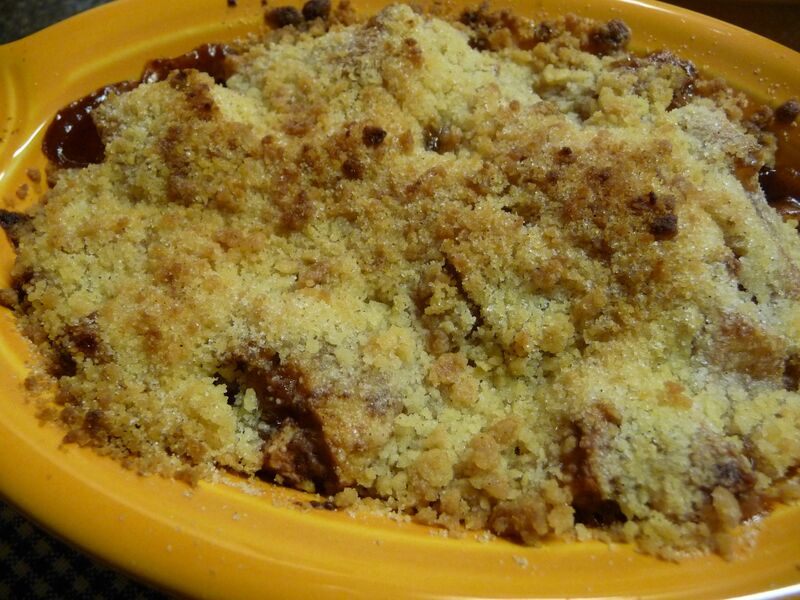 I topped it off with another layer of shredded cheese and some crushed buttery crackers. I baked the casserole at 350 for 40 minutes. 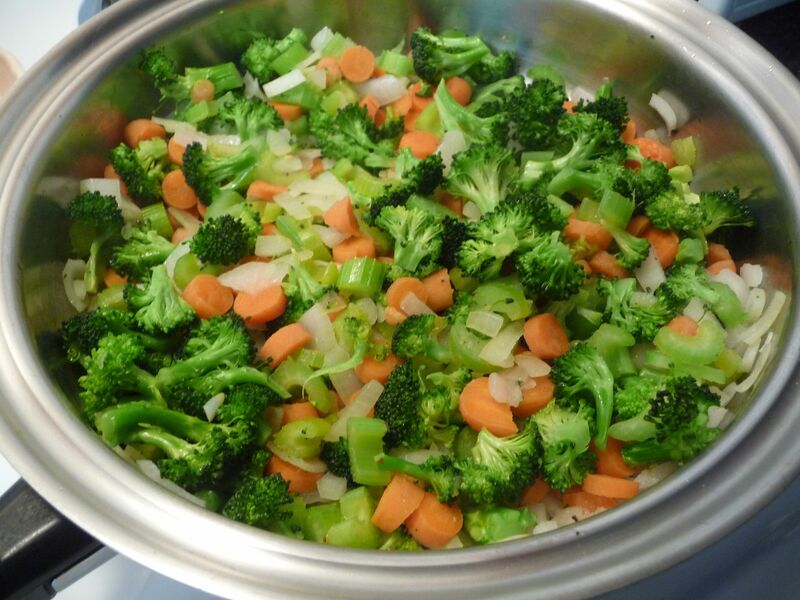 Makes a great side dish or a light meal. Thanksgiving, in our county, is this coming Thursday. Thanksgiving, in our family, came today. Actually, today’s Thanksgiving is just one of the many Thanksgiving celebrations we will have. You see, today, my brother returned to grade school, so to speak. Today, he received a certificate of accomplishment. A major accomplishment. He got to ring the bell — the big gold bell…. a well deserved reward. Today, my brother had his LAST radiation treatment. Quite something to celebrate. Since early October, he has endured being secured to a table – under a mask, contoured to his face, neck and upper body, to keep him still and in the same position to receive radiation beams every day, five days a week. He as also sat quietly while chemotherapy drugs coursed through his veins on one of those days each week. All to try to arrest the metastatic papillary thyroid cancer that had become more aggressive…. now, an angry cancer with a mean streak. While the mask has not been the most comfortable thing, he and the mask have been through a lot and the mask helped to keep him still and in the same position so the radiation beams could be targeted to bombard the cancer, to knock it back. The initial discomfort of the mask now pales in comparison to the current radiation burns on his neck and chest, his ravaged and raw throat complete with thick mucus that he has to cough up or choke on, the awful metallic taste in his mouth and the nausea and vomiting he battles. Then, there is the fatigue…. only rest and sleep… and more sleep can help that. There are new medicines to take: painkillers; anti-nausea; cream to sooth his radiation-burned skin; a liquid to swallow to cool and coat his throat and esophagus. Nutrition now is high calorie ‘shakes’ several times a day, when he can keep them down. Intravenous fluids when he can’t – that really helps him to feel better. All these radiation treatments and chemotherapy infusions are a direct result of a visit with doctors/specialists in Seattle late last September….when he was to have life-saving surgery. He (and the rest of our family) was mentally prepared for the surgery when everything came to a crashing halt. The cancer had changed, spread, became more aggressive. Instead of surgery, more testing. More waiting and uncertainty. More agony. More sleepless hours for my brother. The testing done, he, along with his wife and middle daughter went into consult with the team of specialists while Dad and I stayed in the waiting room. I felt Mom sitting right there with us… and I was hoping that my brother felt her presence too…. he needed her there… we all did. I know she was. Mom was there to bolster us all as we learned that the life-saving surgery was cancelled. (How can that be? What does that mean? Are they giving up?) The cancer dictated what would take place in his life now. Cancer was much worse than expected. It had spread a lot. Surgery would mean removing his voice box, possibly his trachea and maybe a carotid, maybe more, totally devastating his quality of life and without guarantee it would be all gone. He was sent home, back across the state of Washington to get set up with radiation and chemotherapy at a cancer center in Tri-Cities. The new plan was to try to arrest the cancer, slow it down, anything else was to be considered a bonus. Stunned, does not really describe how we all felt. He’s endured much, since he was first diagnosed over a year ago. The other day, at his latest appointment his radiation specialist told him that as bad as he feels now, he will surely feel even worse in about two weeks….. then the long, long road back to feeling better. Feeling better will come more slowly than feeling this bad did. Thanksgiving for the seemingly little, yet GIGANTIC accomplishments like receiving a certificate of accomplishment and the privilege of ringing a big gold bell are worth every blessed moment of celebration. And… Thanksgiving always reminds me of Mom. Mom always loved celebrations, any reason to celebrate was reason enough. Mom always loved celebrating Thanksgiving. Mom always loved celebrating her family. Thanksgiving for now will be giving thanks that my brother is still here… still fighting on. Thanksgiving for now will be giving thanks that my brother has endured his radiation and chemo treatments. Thanksgiving for now will be our traditional family dinner… yet my brother won’t be able to enjoy the food, just the company of his loving family, the energy of his beautiful granddaughters. Thanksgiving later…. when he feels better and can eat food again… will be a feast…. a GRAND CELEBRATION. A truly thankful Thanksgiving celebration.